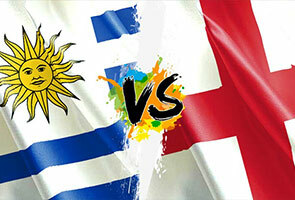 England meet Uruguay on Thursday evening in a game that will go a long way to deciding each sides' respective World Cup ambitions. Gerrard, who has experienced disappointing campaigns in 2006 and 2010, said he underlined the high price of failure in a special address to the squad. "Going into this game, (they have) to realise it could be a terrible long, frustrating summer if we don't get it right on Thursday," he said. "There is no hiding place for a player when you go out of a tournament. You go home earlier than you expect. It can be tough as a player and it can take an awful long time to get over it." Four years ago in South Africa, Germany ruthlessly disposed of England 4-1 in the last 16, and at Germany 2006, they lost on penalties to Portugal in the quarter-finals. After losing their Group D opener 2-1 to Italy, defeat on Thursday would probably consign England to one of the earliest World Cup exits in their history. Gerrard said he wanted the youthful squad to realise how high the stakes were ahead of Thursday's game at Sao Paulo's Corinthians Arena. "A lot of people know that in the dressing room but a few young lads... it was important for them to realise what is at stake and how important this game is," he said. "We all need to leave everything on that pitch. If a defeat was to happen it is probably the most difficult place to be in as a footballer." But Gerrard also said England would draw on their experiences of qualifying, which went down to the wire before wins over Montenegro and Poland. "In the qualification we probably put our two best performances together when the pressure was really on," he said. "That's maybe because you realise what is at stake and you don't really get a second chance. I'm hoping that is going to be the case in the next two games." England's final Group D game is on June 24 against Costa Rica, who beat Uruguay 3-1 in their opening match and play Italy on Friday.